Pop Goes The Weasel as the little handle is turned. When the song reaches 'Pop goes the Weasel' the tin boxes lid flies open and the soft cloth fairy pops out. A wonderful toy that little ones love to see over and over. This toy has a very easy mechanism to operate and the fairy pushes back into the box without a struggle, so small children will be able to reset it. 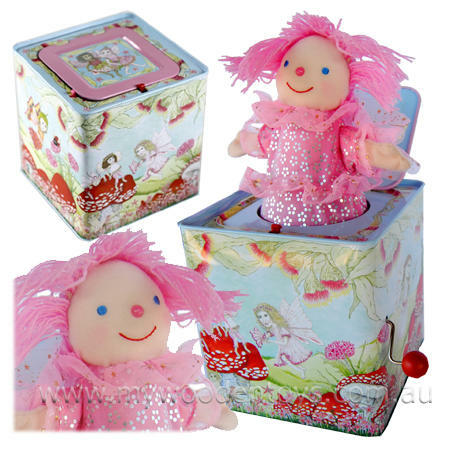 The art work on the protective cardboard box and the tin box itself is designed by Liane Gough and depicts faries in an Australian floral background. We like this because: "A real classic with a fairy twist!"